The footbridge, which connects the university with the city of Sweetwater, was only poened days ago according to CBS Miami. 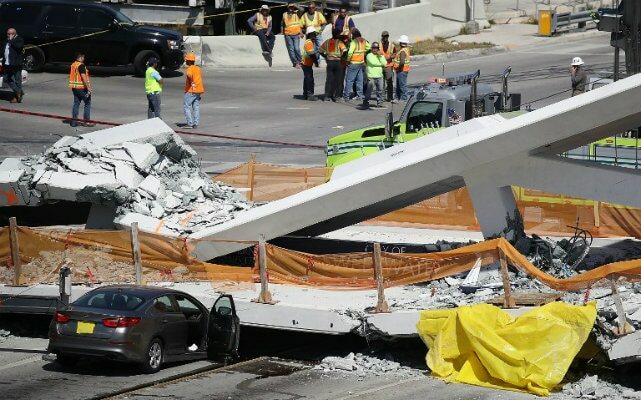 Miami: A pedestrian bridge spanning several lanes of traffic collapsed on Thursday at Florida International University in over Miami highway, trapping people and cars underneath the structure, with local media saying several people were killed. The footbridge, which connects the university with the city of Sweetwater, was only opened days ago according to CBS Miami. Local media has shown footage of firefighters climbing on the wreckage of the bridge while paramedicts treated several injured people. Live footage on CBS Miami showed the bridge had collapsed on top of at least three vehicles. Four people have been confirmed dead in the footbridge collapse. The pedestrian bridge was earmarked to be opened in 2019, but was fast tracked to Saturday. 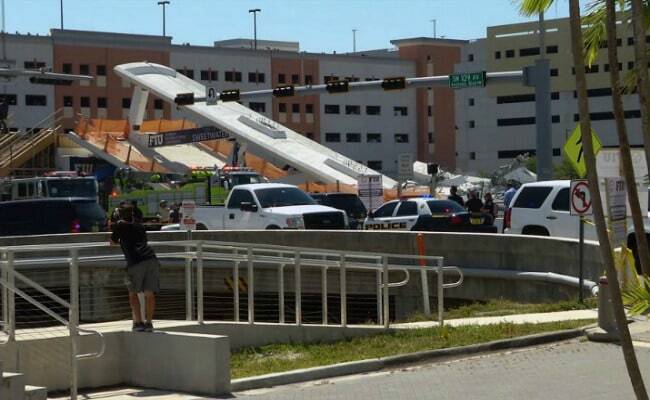 Continuing to monitor the heartbreaking bridge collapse at FIU - so tragic. Many brave First Responders rushed in to save lives. Thank you for your courage. Praying this evening for all who are affected. To keep the disruption of traffic to a minimum, a 174-foot portion of the bridge was built adjacent to the street and was driven into its perpendicular position across the road by a rig in only six hours on Saturday, according to the university. Funding for the $14.2 million bridge is part of a $19.4 million U.S. Transportation Department grant through the Transportation Investment Generating Economic Recovery (TIGER) program, according to the university. The bridge was the first in the world to be constructed entirely of self-cleaning concrete, according to the university. Titanium dioxide used in its construction, when exposed to sunlight, captures air pollutants and keeps the surface white. The footbridge was designed to withstand a Category 5 hurricane, the most dangerous measure by the National Hurricane Center, and last 100 years, according to the university. You can read about the footbridge collapse here. According to local media, the pedestrian bridge was constructed as a person was killed on the Miami-Dade highway. Munilla Construction Management, the company that constructed the footbridge, said in the statement saying their "thoughts and prayers go out to everyone affected by this terrible tragedy." It further added that the company is doing everything they can to assist. The statement also said they will conduct a full investigation to determine what went wrong. Miami-Dade Fire Rescue Department personnel and other rescue units work at the scene of the footbridge collapse. US Senator Bill Nelson told local TV station CBS Miami that six to ten people were killed in the footbridge collapse. Eight vehicles are trapped in the bridge wreckage. The police has advised people to avoid the Tamiami Trail area and SW 107 Avenue. The Florida Highway Patrol has said that several people were killed, according to US networks. The Miami Herald reported the bridge was installed on Saturday morning.